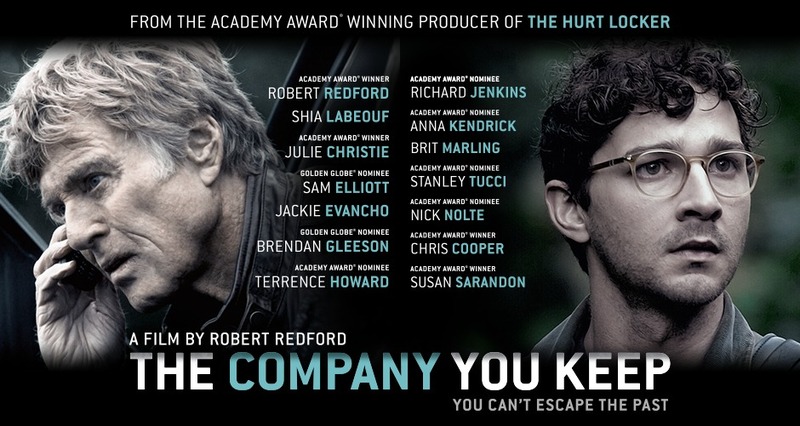 When Weather Underground activist Sharon Solarz is captured by the FBI in Robert Redford’s new film, The Company You Keep, a sequence of events is set off that uncovers a number of other members still in hiding. Solarz, who was planning to turn herself in, is only prepared to speak to young journalist Ben Shepard, assigned by his newspaper to the case. Their conversation is one of several in the film that outlines the dilemmas in which these radicals have been caught, the dilemmas in which the film is intensely interested. For Solarz, there is an antinomy between the personal and the political. ‘Why [turn yourself in] now, after thirty years?’ Children ‘change you,’ she responds. One of those uncovered by these events is Nick Sloane, who had been living as a progressive lawyer for thirty years, but is one of the suspects in the killing of a security guard in a robbery that went wrong. The chief political interests of the movie recur in the conversations between Sloane and his former comrades. On the run from the FBI, he runs from one to another, as he searches for the elusive Mimi Lurie, who we are told has always been wedded to the movement. In these conversations, the former members attempt to make sense of their experience. Each has made some kind of accommodation to ‘bourgeois’ society. Are these accommodations sell-outs or were they wrong to begin with? ‘I grew up,’ says Sloane at one point. ‘We promised each other we weren’t going to do that,’ says his former comrade. These are points well made, for there is no activist who hasn’t at some point had to face similar questions. In contemporary society, there is a fundamental contradiction between personal or individualised interest and left-wing politics. Career opportunities, material rewards, social status – all these are open to the political right or the apolitical. For the left there is sacrifice, a sense of community and personal meaning. Considering the latter two are also available to the right, left-wing politics can’t be considered a good choice for the self-interested. The everyday tasks of life, intensified if one has children and as one ages, make left-wing activism harder to maintain. The Company You Keep does a good job of capturing some of the consequences of this contradiction. As it dramatises many of these personal dilemmas, the film also combines journalist investigation with political thriller. Though not at an express pace, the story drives along nicely, helped greatly by its stellar (if slightly too large) cast. Redford plays Sloane with restraint and Shia Lebeuf is fine as Ben Shepard, the young journalist on the make (Shepard is clearly a stand-in for the self-centredness of the young generation today). Redford directs us through a complex sequence of events with assurance, and there are enough twists and turns for any thriller. And yet, as a political document, these genre demands often exist at the expense of the political themes it hopes to engage with. The Company You Keep cannot quite transcend the boundaries of the question posed by the Weather Underground members themselves: were we right or wrong? Even if at its best moments it suggests that the Underground were right in principle and wrong in method, it cannot quite represent the fact that there were different strategies available to them back in the 1960s. Nor can it explain the emergence of the group itself. 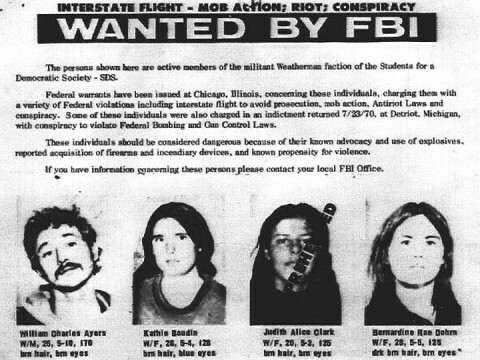 The Weather Underground was formed out of the wreckage of the Students For a Democratic Society, the preeminent student organisation in the US during the 1960s. SDS had several historic generations. The earliest members – those of the famous Port Huron statement of the 1960s – were traditional American liberals taking on increasingly left-wing influences. Their sources were as much in the work of Thoreau and existentialism as in anything else. The generation that followed, that of the middle sixties, increasingly took on revolutionary rhetoric and was influenced by revolutionary theorists of various stripes such as Ché Guevara or Herbert Marcuse. In this period, SDS grew from hundreds to close to 100,000 members. But if SDS grew in numbers, it also became increasingly disorganised and heterogeneous. Quite what it meant to be a member of SDS in these years is unclear. Like much of the American radical movement, SDS was caught in a theoretical and strategic cul-de-sac. On the one hand, they were part of a mass movement against the Vietnam War, on the other, that war continued apace. There was a vast disjunction between the radical movements self-identity and rhetoric as a revolutionary movement and the landscape of possibility in which they worked. Even if there were increasing industrial struggles and huge mass rallies, the radicalisation was primarily one of youth. The ‘Movement’ did not have the social weight to cause a significant crisis for the elites. Social movements, like water, seek their own level. Frustrated by an inadequate public response to the escalation of bombing and by the sheer passage of time, many in our ranks felt the need for more militant tactics. I was one of those advocating such a policy. I believed in making the domestic situation as chaotic and uncomfortable for the warmakers as possible, anyway. On 8 October 1969, the Weathermen (as they were first called after a line in Bob Dylan’s ‘Subterranean Homesick Blues’) organised their famous Days of Rage, where two to three hundred people gathered in Chicago’s Lincoln Park and charged onto the roads trashing cars and windows, smashing into police lines. 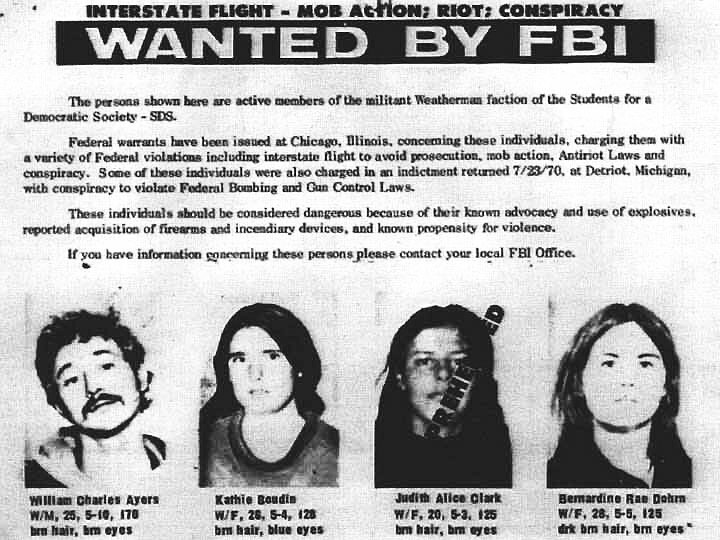 Abbie Hoffman was to later say that: ‘Even though I was critical of the Days of Rage and much of the polemics of the weather underground, I saw great value in their myth and was a part of their support system.’ The logic of these sorts of ultra-left positions was inexorable: between September 1969 and May 1970 there were at least two hundred and fifty major bombings and attempts linkable to the radical white left. Existentialism had turned into nihilism for this later generation. When the Weather Underground emerged from the wreckage of SDS – wreckage for which they were partly responsible – at its final conference in 1969, they stood as the apex of this ultra-left movement. Young, good looking, out-flanking all others from the left (indeed denouncing others as hopelessly entangled with ‘bourgeois’ life) – few could stand against them. To the early generation of SDSers, they were a political disaster. For good reason, many on the left hated them. It is precisely this history on which an assessment of the Weather Underground must rest, and which The Company You Keep does not truly engage. 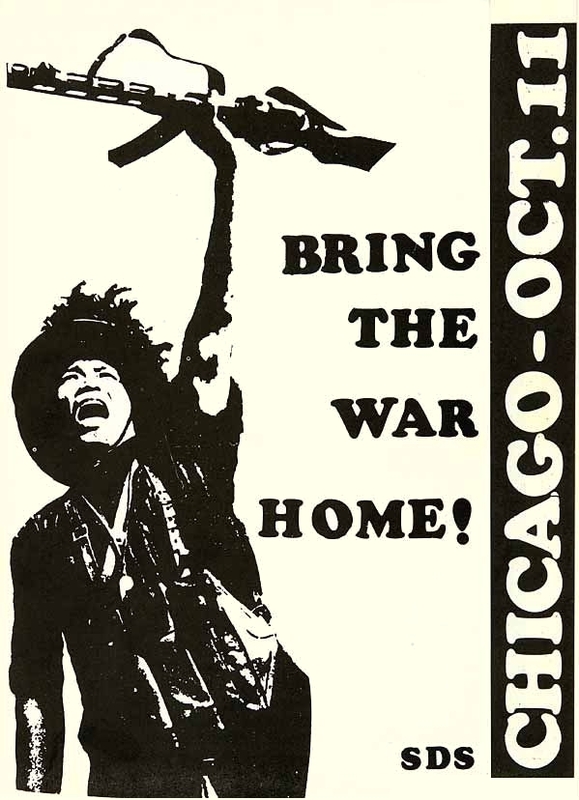 Shortly after the split of SDS, the Weather Underground went underground and began their ill-fated campaign of bombings. They never killed anyone else (though a later splinter-group from them did), and it is here that The Company You Keep breaks from history. Still, the films depiction of the group is not unfair. They are portrayed as idealists, most of whom are self-critical yet still hold, in uncertain ways, to their principles. Indeed, an air of nostalgia hovers over the film and at several points the journalist – a stand-in for the current generation of youth – is contrasted to the old activists. Historically, the Weather Underground fell apart in the late 1970s and most of their leaders are living ‘normal’ middle-class lives. Famous members Bernadine Dohrn (clearly an inspiration for the character Solarz) and her partner Bill Ayers are professors of law and education respectively. If The Company You Keep departs here, as elsewhere, from history, it does so for good reasons – to dramatise that history as a contemporary thriller. The film is part of a recurrent cultural obsession with the ultra-radicals of the sixties, so much easier to dramatise than the less extreme of the movement whose lives consisted of day-to-day organising. And yet, The Company You Keep reopens the debate about them, and meditates on the trajectory of the 1960s left, from activism to family life, for the most part. By doing so in a sympathetic way, for whatever its omissions, The Company You Keep helps to keep those radical fires warm, even if, like Redford and the character Nick Sloane, they come from a world that seems long ago and far away. Must admit I was a bit underwhelmed by the Robert Redford treatment and don’t quite understand how it keeps radical fires warm? Insofar as the film can be taken as suggesting the experience of this group is any way representative leftism from this period then that is a negative, isn’t it? Many apt questions raised here on the back of an uneven film. If there is a “recurrent cultural obsession with the ultra-radicals of the sixties” as asserted, the question of whether they were right or wrong and why should make for an interesting poll in today’s lackadaisical political vacuum. Gary, I think the film is contradictory – much like the Weather Underground themselves. In a certain sense, the Underground were representative of the dilemmas of the US radical left – just a particularly extreme version. (Though what was infuriating to many on the left was that there were other, mor constructive strategies available). Having said that, I think the film doesn’t obviously critique them from the right – is indeed somewhat nostalgic, I think – and in a limited way opens up the discussion about the (as we’re having here), so that’s the sense I meant when I said it kept the radical fires warm.